Just off a head-to-toe revamp, the 2015 Chevrolet Silverado is a competent competitor in the fierce full-size truck segment. 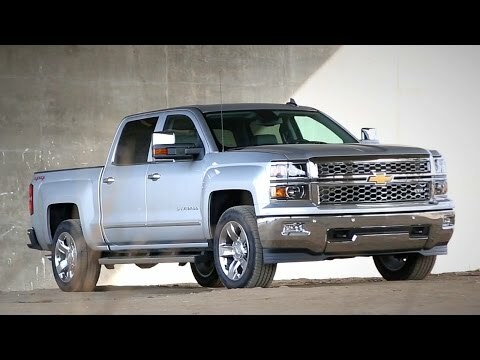 Available with a trio of engine choices and a variety of configurations and trims that range from a basic work truck to a leather-embellished upscale hauler, the Silverado can suit a variety of needs and tastes. We love our Chevy Silverado! Had an issue with the truck dying when you would brake and for no reason at all at times and the steering would not work. We took it in several times and got so frustrated we almost traded it in. Finally we found someone that figured out the issue, and it turned out to be a bad battery connection. Once that issue was resolved we have had no other problems. We love the truck. It is comfortable, roomy, and has Bluetooth, GPS. One thing I might add is that I am not a tall person and sometimes it can be hard to see to the left when I am looking before turning or changing lanes. My husband does not have that problem so I think it is my height so it would be nice if the seat could raise you up enough so you could see out better. The acceleration is great because we drive a lot of highway miles and merging in and out in a large metropolitan area is a necessity. So far as maintenance goes, we keep the oil changed and the air filter on time and we have had no problems. It gets about 19 mpg and runs great. The ride is pretty smooth and it corners and handles very well. Also when the weather is icy or slippery it handles the road conditions just fine. This is what we drive in bad weather, period. As for the looks of the Silverado, it is a good looking vehicle. I love that you have the OnStar and satellite radio trials added also. There is plenty of legroom in the back for the kids and occasional adult that rides back there. Very easy to buckle in car seats also. We love your Silverado! I love my Chevy Silverado z71! And I love having all the bells and whistles! It has all the bells and whistles, absolute favorite feature is the heated steering wheel in the winter time. I have not had any issues with my truck, it runs perfectly. The seats in the crew cab flip up making it very convenient to haul groceries, or larger items that I do not want to put in the bed of the truck. There is an extra step in the rear bumper to help get into the bed of the truck. In the summer I switch to two wheel drive to help improve my gas mileage, in winter I switch back to on-demand 4WD. It also has two memory settings for the driver's seat, making it convenient for two driver's to automatically move to their preferences, a huge plus since I am shorter and need to raise the height of the seat, my boyfriend says it is like getting into a clown car, so he can hit his setting and make it easy for him to get into the truck. This vehicle is reliable and comfortable. Comfort: every seat in the truck is comfortable. The heated and ac options for the front seats are great. The heated steering wheel is better than I thought it would be. I love and use all of the extras. Problem: there are no vents in the back seat area. This is an extended cab, which means in the summer, the people in front are freezing while the people in the back are barely cool and vice Versa for the winter. Reliability: I have never been in a driving situation where I have not felt safe. The safety features have saved us in a couple situations that could have turned out bad. Performance: great get up and go, great towing power, never had any major or minor problem. Overall great vehicle.